Guests are in exceptional hands with Captain Stuart Armstrong at the helm. Stuart is a highly experienced sailor with over 140,000 logged sea miles and ten ocean crossings. Stuart discovered his initial passion for sailing as a teenager, when he had the opportunity to crew on a friend’s yacht. During his early 30’s, on a Sunsail charter holiday in Turkey, he re-ignited this passion – returning to the UK and immediately booking on to an RYA course. The next seven years were spent gaining sailing experience and tuition; culminating in Stuart attaining his RYA Cruising Instructor qualification. Captain Stuart has worked in the sailing industry ever since; he has a huge repertoire of sailing stories to enthrall with, and is happy to share his knowledge and experience with novice sailors. 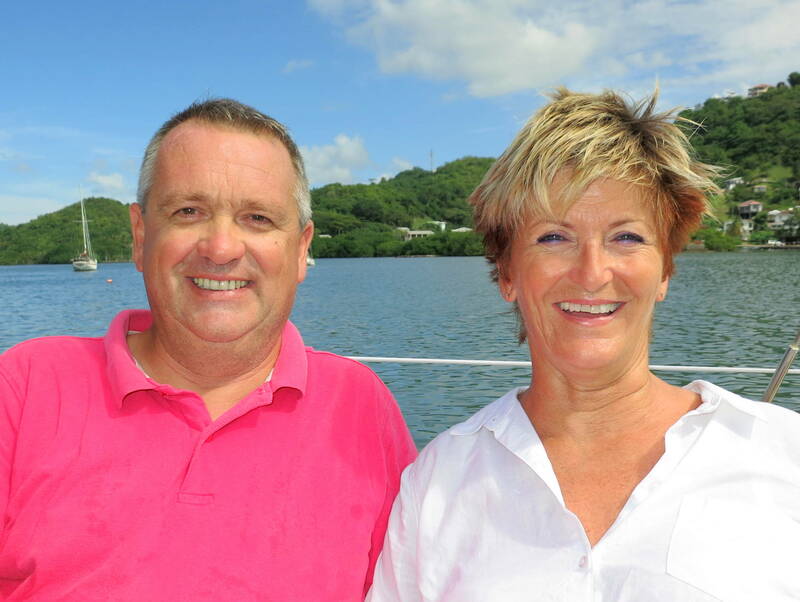 Having previously worked and skippered on the New York-Falmouth and Gomera-Antigua Ocean Rowing Races, Stuart was flown out to skipper “Desi”. She was working as a support boat for the rowing race from Australia to Mauritius; he fell in love with Desiderata the first time he saw her. Captain Stuart Armstrong and First Mate Julia Neustein of S/Y Desiderata. Stuart and Desiderata then set sail from Mauritius, heading round Madagascar to South Africa; from there Cape Hope to Brazil, via Saint Helena and Ascension Island. Arriving in time for the Caribbean season, “Desi” cruised the islands and competed in Antigua Sailing Week 2011. Finally, Stuart skippered her on another transatlantic crossing back to Europe. Docking in Majorca, Stuart met his next true love – Julia. With a background in interior design and theater, Julia brings a fun-loving personality and creative flair to Desiderata. As the first mate, she ensures everything runs smoothly below decks; ably assisting Captain Stuart above decks during racing and sailing. Stuart and Julia are accomplished cooks; their passion for “Desi” is rivaled only by their enthusiasm for culinary entertainment and delighting their guests on board. Together, Stuart and Julia have sailed Desiderata throughout the Ionian Sea, over to Gibraltar and the Canaries. They then successfully completed the transatlantic crossing back to Barbados for the start of the 2012 Caribbean sailing season. During low season in 2013, Desiderata undertook a major refit in Grenada, West Indies, and is now available to charter for classic yacht racing regattas and sailing charters. Please see the rates for more information. Stuart and Julia positively shine as they show new guests around Desiderata. She is their pride and joy, and they have the welcoming ability to encourage all visitors to feel part of this classic yacht’s exclusive crew.